Ptune3 uses the same SH7305 CPG formulas as Ftune2. 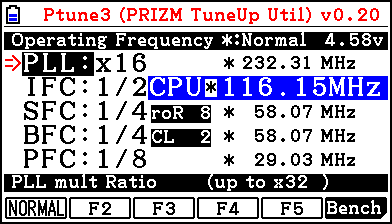 On the fx-9860G II, timers calibrated with Ftune2's frequencies are indistinguishable from the RTC. On fx-9860G II, both the timer and the RTC count at the same speed. Counters increment simultaneously even after 3/4 minutes. On fx-CG50, the timer shows an error of 1 second after 40 seconds of counting. It increments its own counter later than the RTC, which indicates that the frequency of Pϕ was overestimated. The calculated frequency for Pϕ is 29.491200 MHz; some binary trial-and-error suggests a frequency around 29.04 MHz. A driver problem is possible, but looks unlikely to me because the whole thing works flawlessly on fx-9860G II. - Can anyone confirm this issue? - Could there be a Clock Pulse Generator setting with different meanings on fx-9860G II and fx-CG50? - Is there anything else to explain the difference in frequency between the models? I did not check the details, but confirmed that it was slightly late than before. When I test it,I can confirm -1.6% down surely now. Is this a bug of the CPU? Or is it a frequency drop by down spread spectrum? I do not really understand a cause. If any program goes down by -1.6%, I will do update of the -1.6% indication of Ptune3. I think it would be possible to detect whether all the CPG parameters have their expected meaning, by measuring the clock frequency for each possible value of the parameters. I don't know if there can be an electrical cause. To be honest I only understand the software aspects of the problem. Because I did not have a measuring instrument, I checked it on a radio easily. I can confirm clear peak frequency in CG20 when I hear a noise on the radio which air band (118~137MHz) can receive. I cannot confirm it in CG50. I think that it is caused by down spread spectrum. Here is frequency correction update. Thanks to SimonLothar, It was confirmed to be the down spread spectrum. "A4150044 dd dd SSCGCR (Spread spectrum control)"
Here is new update version corresponding to spread spectrum control (on/off).